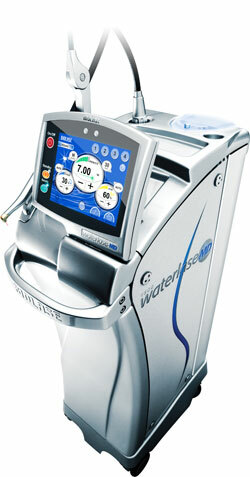 WaterLase is a cold laser technology developed by BIOLASE (www.biolase.com) for use in dental procedures. It combines air, water and laser energy to provide a cool, virtually pain-free experience. At LB Dental, we use the WaterLase laser instead of traditional dental drills, which provides many benefits to our patients. What kind of procedures are performed with this laser? We perform a variety of procedures with the WaterLase laser, including root canals, treatment of tooth decay and cavities, and many other general and cosmetic dental procedures. Whenever possible, we opt to use the WaterLase laser in lieu of traditional drilling. Virtually painless procedures. Since the WaterLase uses targeted laser energy combined with water, there is no generated heat, vibration or pressure. Often times, the experience is so gentle, anesthesia is not necessary. Faster healing times. After many dental procedures, it can take weeks to completely heal. Because the WaterLase laser is so accurate and precise, there is less bleeding, less swelling and reduced trauma, which results in substantially reduced healing times. Fewer visits. By using the WaterLaser laser, we can perform many procedures in a single visit. Often we can do the preparation and perform the procedure without any waiting!